The first New Year’s Eve Ball in Times Square was dropped in 1907. Owner of The New York Times, Adolph Ochs, wanted to create a New Year’s Eve midnight show to draw attention to Time’s Square. Chief electrician for the Times constructed a 700-pound, 5-feet in diameter ball of iron and wood with 100 25-watt bulbs for this shows. While this may have been the most “glamorous” ball constructed to date, the notion of dropping a ball to indicate time was not a new concept in and of itself. That idea can be traced back to 1818, a time when the most accurate way to keep time was through observations of the positions of the sun and stars from an observatory. Accurate timekeeping was crucial to sailors in determining their longitude at sea – a place where observatory access was not always convenient. Royal Navy Officer Robert Wauchope invented a way to signal the exact time to ships offshore. In 1824, he shared his plan with the Admiralty. He wanted to design a “time ball” which was a hollow metal sphere on a pole that could be dropped at the exact time each day from an observatory. Ships could then observe the ball drop from a distance at sea. 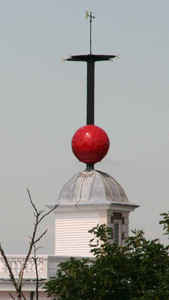 Wauchope erected the first time ball at the harbor in Portsmouth, England in 1829. The ball was dropped at 1pm each day. It was raised half way about 5 minutes before to let ships know that 1pm was approaching. 2-3 minutes before, the ball was raised all the way. Then at exactly 1pm the ball was dropped. The time was recorded at the beginning of the descent not when it reached the bottom. 1pm had passed when it reached the bottom. The time ball in Portsmouth was a huge success. In 1833, two more time balls were constructed at the Greenwich Observatory and St. Helena. An additional ball was added in Cape Town, South Africa in 1836. Soon after, time balls could be found on every continent. A version of the time ball could be found in public squares in U.S. cities. A giant sphere would descend from a pole everyday at noon so that residents could accurately set their watches. 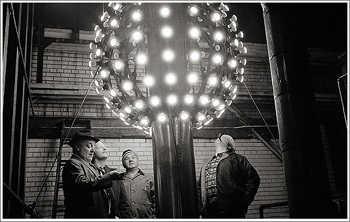 It was these time balls that led to the dropping of the giant ball at midnight in Times Square. Now all across the world, the dropping of a ball or object has become a tradition for ushering in the New Year.